As your outdoor living space comes together, it’s normal for your excitement to build as you look for ways to utilize your newly completed space. The anxiety of planning the perfect event can be overwhelming, but you don’t need to wait for a proper occasion to have people over and entertain. Whether you prefer to enjoy those summer nights by the outdoor fireplace or afternoons by the pool, there are definitely some fun activities you can host in your backyard to entertain your loved ones. Enjoy your summer nights with your family and friends in your awesome backyard space with these outdoor entertainment ideas. If you’re lucky enough to have a pool and grill in your backyard, it’s time to put them to good use and host a timeless summer activity: a pool party! All great gatherings require great food. So while hamburgers, hotdogs, and steaks are always a favorite, chicken, fish, fruits, and veggies taste great grilled, too — and who doesn’t like “shrimp on the barbie?” Aside from making sure there is enough meat for the grill and food for your guests, it’s important to make sure your guests swim safely. If children will be there, it is imperative to have visual adult support at all times. Having an assortment of colorful floaters and rafts is a good way to add fun and style to your pool party, while providing a little extra safety in the pool as well. Add more style to the party with colorful decorative accessories, or candles and glow sticks during a night swim. 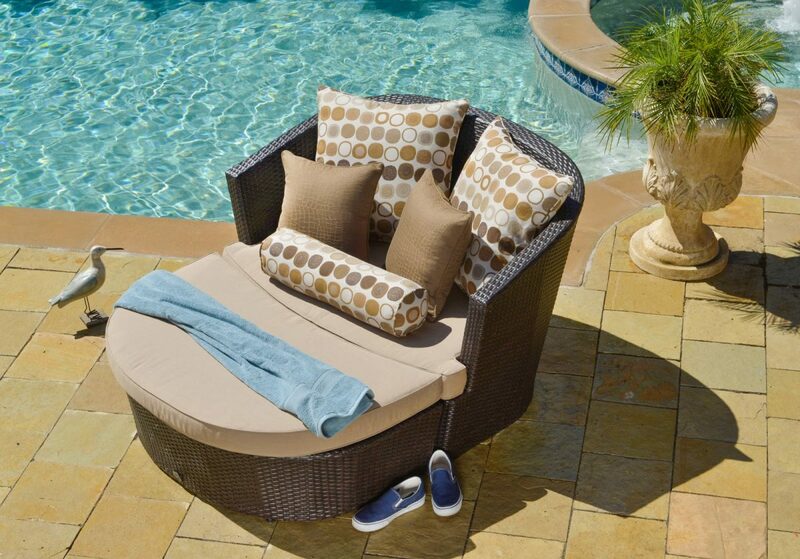 Whether they’re there to swim, sunbathe, or lounge around, your guests will need enough pool-side seating to feel comfortable. Spread some picnic blankets out on the lawn, incorporate an outdoor sofa or a few chaise lounges around the pool, and don’t forget some patio umbrellas for some much needed shade. Perhaps you don’t have a pool, but a great outdoor dining space with plenty of lawn space. Try hosting an afternoon full of outdoor games such as outdoor bowling, corn hole, flag football, volleyball, or even croquet! And of course, you can’t host an afternoon of games without a good amount of food. Make it a potluck and ask your guests to bring their favorite game/outdoor activity and favorite dish to share. As the host, make sure you have enough meat and main dishes. Invite your guests to bring complimenting entrees like side dishes and desserts. Since it’ll be a day of competition, have a little fun and make it a contest to see who can bring the best tasting dish, or the most creative dish. Your guests will also be quite tired after a long day of constant competition, so make sure your guests stay hydrated with plenty of water and other fluids. There are many umbrellas and tent options available to provide ample shade for your guests. Looking to host a more intimate event? You can never go wrong with hosting a dinner party out in your new and improved backyard space. Bring the indoors outside and set up your delicious feast in your outdoor dining area, or cook your entire meal outdoors if you’re lucky enough to have an outdoor kitchen area. Get creative and make it a themed dinner party, or keep it simple with the right lighting and accessories to create the atmosphere you want during your dining experience. Add a little music playing in the background while you’re at it with a small Bluetooth speaker. If you’re looking for some tips on how to set up the perfect dining area, we have some suggestions for you. 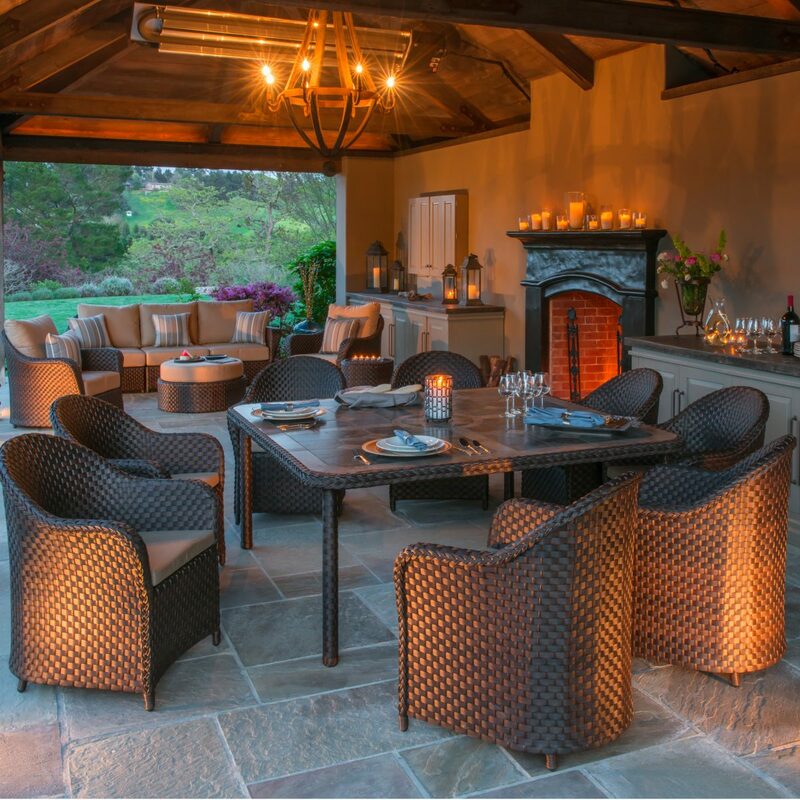 Prepare your favorite dishes, light some candles, pour some wine, put on your favorite songs, and get ready to start a dinner party tradition in your new favorite outdoor space that will last for years to come. As day turns to dusk and night begins to fall, it’s the best time of day to have an outdoor movie night. A movie night requires a good space for a proper outdoor seating area and a large projection surface. 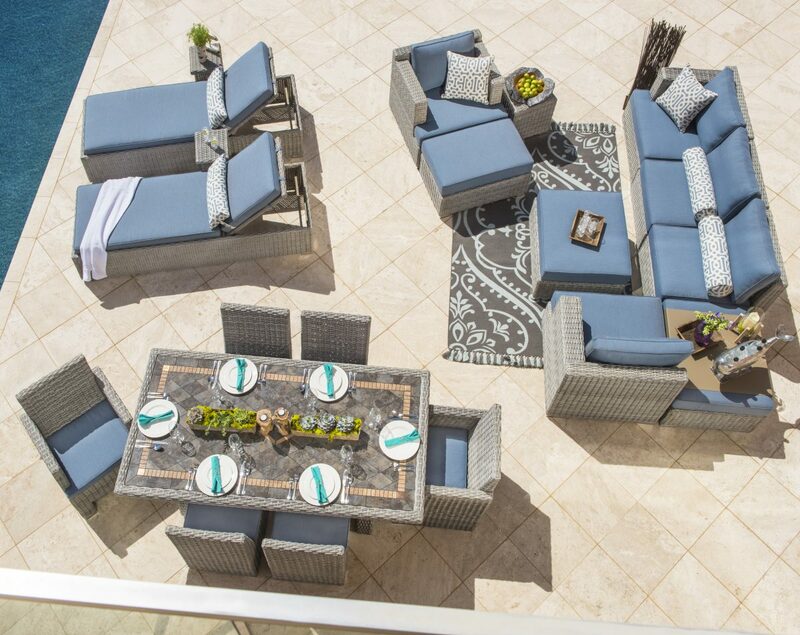 For seating, club chairs, outdoor patio deep seating sets, and modular patio furniture are a great way to bring your indoor screening room outside. Other creative options are airbeds, inflatable chairs, blankets and don’t forget pillows — lots of pillows. It may get cooler as the sun begins to set so have throw blankets available to keep guests warm as well. Also, once your guests start to settle in before the movie, nothing can ruin a memorable evening quicker than mosquitoes. Have some bug sprays, citronella candles, and torches nearby to keep the pests away. As for the things you’ll need to display the movie, don’t feel overwhelmed as the set up is easier than you think. All you’ll need is a movie player (dvd player or laptop), a screen or something to project the movie on, a projector, and small sound system. And of course, a selection of awesome movies to screen. Creating soft lighting is an important safety factor and will add a festive feel to your outdoor screening area. A great way to accomplish this without interfering with the film or home movies of the last family reunion, is with lanterns, string lights, candles, or tiki torches. Complete your movie night with a good amount of snacks to munch on during the movie, along with some post-dinner drinks for the adults and hot chocolate or ice cream for the kids. Also be sure to let your neighbors know about the event (and invite them, too! ), as you don’t want to disturb them with excess noise. 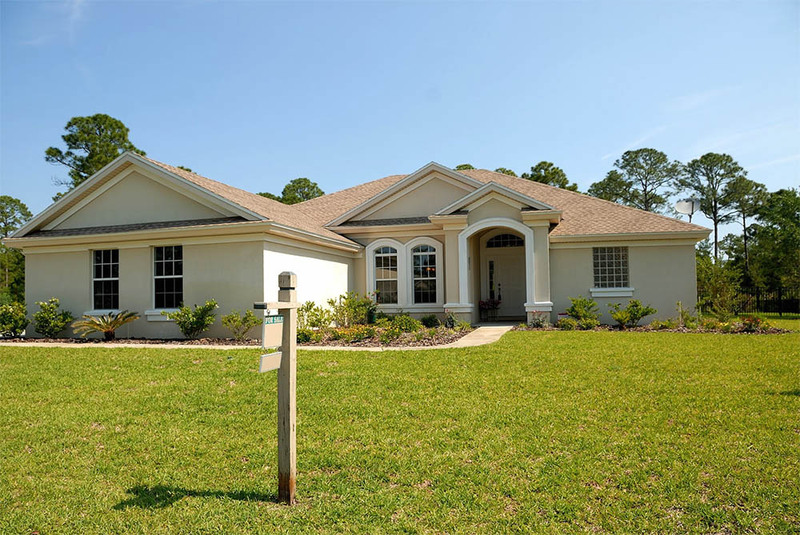 Enjoy creating a space where memories will last long after the credits roll. If space and time allow, you can save the trip to a faraway campsite and have your own camp night – or rather, “glamp” night – right in your own backyard. Start the night off with a bonfire and your favorite campfire snacks. Don’t forget to grab some sticks and that bag of marshmallows for that inevitable s’mores contest. Always follow local municipal code and build your fire in a controlled space and time it so the fire winds down as the night does. Remember to focus on what is needed to make everyone comfortable sleeping outdoors. Make sure there are sleeping bags for everyone, and while it may not be as necessary for the kids, an airbed for the adults will surely make for a better night’s sleep. Proper tent space will offer protection from bugs and the occasional late night shower. And due to the benefits of glamping in your backyard, if anyone needs anything at all, the house is always right there. If you’re feeling ambitious and your space and budget allows, you can combine all of the suggestions above into one memorable summertime event in your incredible outdoor living space. With enough food and drinks, ample amounts of outdoor seating, and your favorite company, you can host an endless amount of activities and events in your backyard for years to come.